The overcrowded room at the San Francisco Planning and Urban Research Association this afternoon represents just a fraction of the 250,000 people who use Market Street every day, but signifies the public’s growing interest in the street’s improvement. The findings released at a 12:30 p.m. forum will be the basis for the Better Market Street Project, an initiative between city agencies and community groups to revitalize the stretch from The Embarcadero to Octavia Boulevard. Surveyors recorded pedestrian traffic and stationary activity, as well as evaluated crosswalks, intersections, and public spaces. Research showed that nearly half of Market Street users are pedestrians, accounting for 49 percent of its traffic on weekdays, said Kris Opbroek, the project manager from the Department of Public Works. Of people who use public transit along Market Street, 32 percent navigate on foot after arriving at their destination, she said. Opbroek said she expected a high percentage of pedestrians, but the heavy concentration of walkers between Fourth and Fifth streets was surprising. The area encompasses the street’s retail hub, including the Westfield San Francisco Centre. Market Street motorists and bikers represent the remaining 14 percent and 5 percent, respectively, of weekday traffic. About 75 percent of the people on Market Street are involved in stationary activities, such as waiting for a bus, said David Alumbaugh, a senior urban designer for the San Francisco Planning Department. However, the staying activity for the street is slim. “How little people come to Market Street as a place, versus just passing through, is surprising,” Alumbaugh said. He said he hopes the improvements will focus on making Market Street a destination rather than a layover. “People should meet on Market Street, as you might meet someone in Union Square,” Alumbaugh said. One of the challenges attaining that goal will be city’s transit system, which operates above and below Market Street, he said. 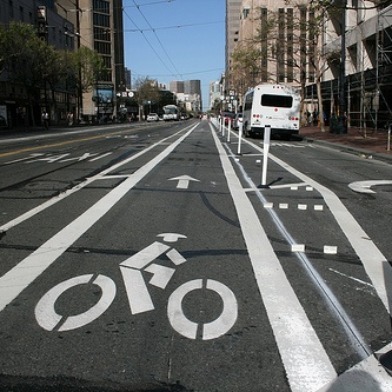 Improving Market Street also means improving the street’s public transportation, by reducing congestion, loading delays and conflicts between motorists, pedestrians and bicyclists. Mass transit in San Francisco usually averages 8 mph, but Market Street’s weekday average is less than 6 mph both inbound and outbound, Alumbaugh said. While 20 percent stationary time is ideal, the research revealed that Market Street transit systems are usually not moving half of the time. Making Market Street transit more effective is one of the improvement ideas Opbroek hears most. Other top concerns involve making the street “more happening” and safer for bicyclists, she said. Many cyclists have expressed desire for facilities that would separate them from motorists in order to prevent crashes, Opbroek said. Lack of personal safety is also a deterrent highlighted in surveys collected by the project. Gary Malazian, a member of the San Francisco Planning and Urban Research Association, walks on Market Street every day. His vision for the street would involve sheltered gathering places, with colorful, modernistic designs to entice people to stay. But creating public spaces could be problematic because it can attract the homeless, which detracts from Market Street’s appeal, Malazian said. To offer input to the Better Market Street Project, comments can be left at www.bettermarketstreetsf.org. There are several open workshops planned for October, which will discuss proposed ideas and improvement.